Hailing from Seattle and being the latest and greatest success story from the ever-so-hip and cultured Sub Pop records, Fleet Foxes have taken the folk-indie world by storm. With their latest Self-Titled release topping sales charts, this fivesome know how to bring it on stage. The people watching at these types of shows make me feel old: The “hip” facial hair, vans shoes, and cell phone glow was nothing to be missed, It’s like an indie-rock Lagoon -- quite a spectacle. The Fleet Foxes’ mellow, sweet sound takes all the best parts of My Morning Jacket and Simon & Garfunkel mixed with vocal harmonies that would make any barbershop quartet jealous. Truly, the vocal harmonies are what make this band. Though they use the harmonies to close every song, they keep it interesting and original enough that you never realize they’re basically milking this underused style. With four of the five members all harmonizing at once, I’d imagine they have a pretty regular practice/warm-up period before shows to get the mixture of vocals just right. Focusing mainly on songs from their latest release, Fleet Foxes played an incredibly beautiful set. The band hit all the right moods at the right times, and I really haven’t heard a show sound this good live in a good long while. The performance closely matched the record, but the songs were different enough that the band delivered a unique live experience. My only complaint is the venue itself. The Foxes played on the Club Sound side of the venue, which has a much more personal feel to the show than the other side of the club, but people who want to work on their beer gut whilst enjoying the show catch no breaks. With only a few doors open to peer at the stage, most of the noise you can hear comes from the drunken talkative hipster that wants to be heard and not enjoy the spectacle on stage. Naturally, once the band started my wife and I packed in like sardines to the sold out “all-ages” side of the show. The lead singer, Robin Pecknold, was the shining star of this performance. His voice alone is enough to hold the band, resonating perfectly through the room to even shut up the dancing, curly-haired, blondie in front of me. 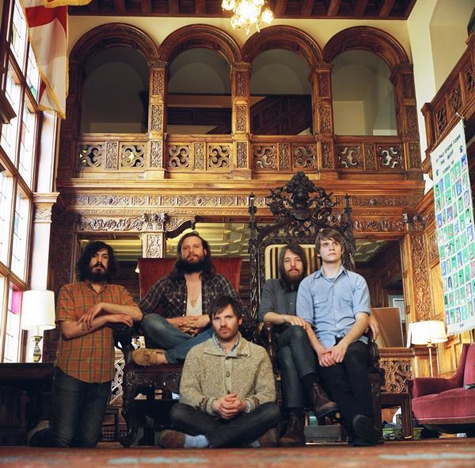 At one point, the band exited the stage and left Pecknold to perform a song by himself. Noticing the talkative crowd, he decided to not use a mic, stood on the PA and belted out a heartbreaking solo song I was unfamiliar with. Some of the choice tracks that they played were “Your Protector,” “Ragged Wood,” “Oliver James” and closing the set with my favorite track, “Blue Ridge Mountains .” As much hype as a band from Sub Pop usually gets, this hype is well deserved. Don’t miss this band if they come through again, as they delivered what is easily one of the best shows I’ve seen in the last couple years.